I think it was the Ancient Greeks who once said “Know thy breaker,” and they know what they were talking about. Without such knowledge, jobsite hazards and operational bad practices will inflict way more damage on your equipment than you are hoping to inflict on the task at hand. 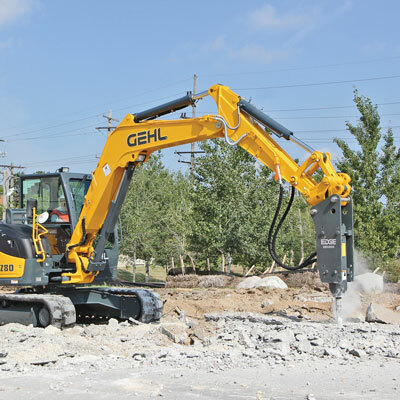 In this article, we will discuss picking, pairing and using a hydraulic breaker/hammer specifically for compact excavators. To make the right decisions in attachment selection and ask the right questions of your dealer or manufacturer, here is a “breakdown” of what you need to know. Mismatching size and weight between a breaker and a carrier is guaranteed to cause a ton of problems. Consider some of these cause-and-effect dominoes. First, there is performance. Using a breaker that’s too small or too big for the mini excavator can lead to less productivity because the carrier is not able to provide the optimal breaking pressure. 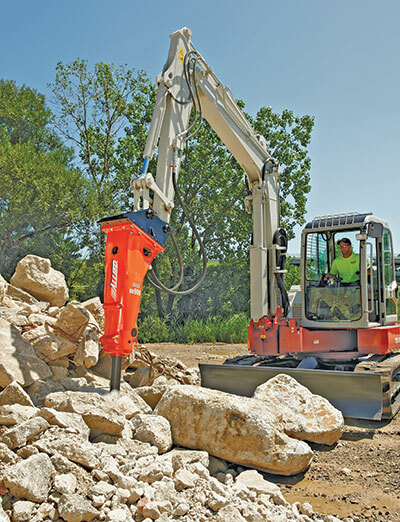 A breaker too small for the excavator might not handle a large piece of material, so operators either need to move the breaker closer to the edge of the object, such as a piece of concrete, or find a larger breaker. Alternatively, an oversized breaker only sends a portion of its energy through the material. Generally, if a breaker consistently runs for 30 seconds without any signs of progress, you should select a larger breaker. The most common mistake is not moving the tool enough during the breaking. That is, the operator will accelerate tool wear by not moving the tool often enough in material that is difficult to break. Improper tool positioning can also reduce productivity and lead to hammer damage. The tool should be kept at a 90-degree angle to the work piece at all times. And where there is poor performance, there are likely larger problems to follow. Matt Franzel, product manager of hydraulic attachments for Atlas Copco, says if a breaker is too large for the carrier, it will transmit percussive energy both toward the material and through the equipment which makes for extremely unsafe working conditions in addition to excessively wearing out the machine. “The energy traveling through the equipment can fracture the carrier’s boom and do worse damage to the construction site,” Franzel says. Too large of a carrier fit with a smaller breaker, according to Greg Petherbridge, Chicago Pneumatic Construction Equipment, will cause premature breakage of tools because the tear out force will be too great for the breaker to handle. We’re talking damaged mounting brackets and decreased service life for the breaker. “In addition, a large excavator with a small breaker will cause stress on shock absorbers and make them wear prematurely,” he says. In a hydraulic breaker, this also means overheated hydraulic oil, which will lead to damaged seals inside the breaker as well as the carrier’s hydraulic engine, according to Franzel. Petherbridge notes that there are three-powered versions of breakers: all gas (nitrogen), all hydraulic and hybrid (gas and hydraulic). Since the late 1970s, most breakers have used a combination of hydraulics and nitrogen gas to fire the piston on a hammer. Under hydraulic pressure (measured in psi) the piston rises and compresses the nitrogen gas. When the piston reaches the upper chamber, the hydraulic pressure is released, the nitrogen expands and the piston is forced down. The oil (measured in gpm) determines how fast the breaker hits in blows per minute (bpm). Today, most gas-assisted breakers are fired using about 75 percent nitrogen gas. In a fully hydraulic breaker, hydraulic fluid drives the piston up from the breaker’s lower chamber to the upper chamber. As the piston rises, it forces the oil in the upper chamber into the energy chamber, which causes pressure to build. Once the piston reaches the top of its stroke, the high-pressure hydraulic flow pushes the piston downward. Mismatching size and weight between a breaker and a carrier is guaranteed to cause a ton of problems. In terms of cost, usually the more power, the larger the investment. However, as Petherbridge points out, the more powerful a breaker is, the quicker the job can get done, which ultimately means profitability. Chicago Pneumatic has a lineup of light-, medium- and heavy-duty breakers. The light-duty is primarily used for light demolition, landscaping, building renovation and road construction. Medium is for demolition, building renovation, road construction, rock excavation and quarrying. Heavy range is used for medium and heavy industrial demolition, building renovation, road construction, rock excavation and mining applications. Once a dealer or manufacturer matches a breaker’s size to the carrier, contractors should know what kind of impact power they are getting, which manufacturers typically measure in one of two ways: a calculated foot-pound (ft-lb) class or an AEM rating. When comparing breaker power, Franzel suggests looking at the AEM ratings in addition to the ft-lb rating because the AEM rating that measures the force a breaker produces in a single blow through repeatable and certified testing measures. Body style can vary between models and manufacturers, but two of the main differentiators, according to Franzel, are box-style or solid-body encasements. Box-style breakers have, you guessed it, a squared body that is meant to protect the internal percussion mechanism. These breakers are fairly versatile and can come with a high power-to-weight ratio. Atlas’ EC 40 for 1-1/2- to 3-1/3-ton carriers deliver 105 ft-lbs of impact energy, which is great for daily breaking tasks, and the HB 10000 can fit carrier weight classes as heavy as 154 tons and deliver 11,985 ft-lbs of impact energy. Solid-body breakers have an integrated percussion mechanism inside a single cast iron body. This design creates a slimmer profile that provides more maneuverability and is ideal for working in narrow trenches or work spaces with limited access. Atlas’ SB breakers can fit a wide range of carriers, from 3/4 to 19 tons. When it comes to mounting components, some will match specific carriers and some will be universal (adjustable pins, bushings and other components) and apply to several different carrier sizes. What if you are working in a zone near a school or hospital that has noise or vibration restrictions? Just because you will be breaking or demoing doesn’t mean you have to be super loud, as long as you have the right attachment. Some breakers will have systems that dampen noise and vibration. 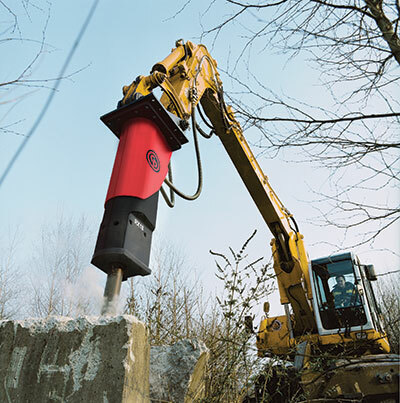 Atlas Copco, for instance, offers a VibroSilenced Plus system in many of its breakers, which is meant to isolate the percussion mechanism and breaker box with polyurethane and guiding elements, as well as seal all openings on the breaker. Even after equipping yourself with all this knowledge, you’ll want to work with a dealer or manufacturer when selecting a breaker as they will help figure out the size and output you need for the material and jobsites you will be dealing with to best optimize performance. By nature, these are very self-destructive products, and they can be very expensive to repair when they break down. Maintenance is a key factor for optimum performance of the hydraulic breaker. It is important to maintain the condition of the moil point or “working steel.” The moil point transmits the piston impact energy down into the material. A worn moil point will reduce the efficiency of the breaker, so it’s important to perform your daily maintenance, as per the owner’s manual. When greasing the hydraulic breaker, hold it in an upright, vertical position, being sure that the moil point is fully engaged into the breaker chuck. Be careful to avoid over greasing, which can cause damage to the hydraulic breaker. Edge hydraulic breaker are available from 150 to 1,500 ft-lbs and are available for compact excavators, skid steers and track loaders. Chris Crowell is a contributing editor with Compact Equipment.